The game was played on July 21, 2004, at Fenway Park, and each year at this time the video keeps popping up on every social media outlet known to every man, woman and head-buried-in-their-cell teenager. 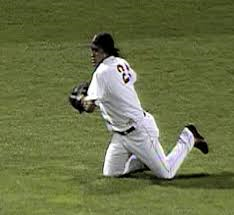 It’s David Newhan of the Baltimore Orioles hitting a curve ball from future Hall of Fame pitcher Pedro Martinez off the center field wall, ultimately triggering what may be the most famous of the many incidents known as Manny Being Manny, a top ten on the MLB network’s parade of bloopers. This one, of course, hits home. Boy, does it. After all, David Newhan is our son, then and now. He doesn’t live at home any more. He lives elsewhere in Southern California with his wife, Karen, and their children: Nico and Gianna. He works for the Angels as their minor league infield coordinator. We try to visit often, and every year at this time he suddenly appears again in uniform on our family room, bedroom and office TVs hitting that curve ball 400 feet. Connie and I enjoy seeing it–what parents wouldn’t be proud?–and our friends (and many strangers) seem to enjoy it as well. “Good swing,” noted my golfing pal Richard Gonzales, the former police chief here in Corona. David would emerge with a two run, inside the park home run, and so what if the event will always be remembered for the actions of Boston left fielder Manny Ramirez, whose eccentricities in uniform and out remain vividly captured in the Manny Being Manny phrase, something of a curse to every other Manny who was and is more–should I say–normal in performance and personality. David was dismissed by baseball scouts and Division I recruiters out of high school but persevered through the percentages arrayed against him to play parts of eight seasons in the majors, playing every position except pitcher, catcher and shortstop. Injuries interceded at rotten times but he trucked on, emerging with a positive WAR and the memories of a terrific second half in that season of ’04 when the Orioles gave him the opportunity to play regularly and he responded with a .311 batting average and a .361 on-base percentage only for the Orioles to decide in the spring of ’05 that he was a utility player. It was one of those baseball decisions that created a lot of head shaking in the Baltimore camp, but even then this was an organization in which it was difficult to tell who was calling the shots and why. Nevertheless, I digress, forgetting that David always felt it was better to put on the uniform no matter the circumstances than to have become, for instance, a reporter like his dad. “I heard him cuss out the computer too many times,” David often said when asked. So, on that July night in a packed Fenway, he remembers heading to second base as center fielder Johnny Damon made an unsuccessful leap for the ball. He would easily slide in with the home run, having no idea what had happened behind him. “The guys in the dugout were kind of laughing, but I didn’t know until I saw the video,” David said. What had happened was that Damon retrieved the ball and threw in the direction of his cutoff man, shortstop Mark Bellhorn, only to have Ramirez, coming over from left field, inexplicably dive and cut the throw off before getting up and throwing to Bellhorn, whose subsequent throw to the plate was now much too late. Ramirez was a 12 time All-Star and eight time top 10 MVP finisher when he had both feet on the ground and in the batter’s box. There were other times when he could be seen wearing headphones to work in left field and/or slipping through a door into the Green Monster at Fenway to make a call or get a drink–once even leaving left field unattended while a pitch was being made. There are many top 10 lists of Manny Moments, and there were 2 1/2 colorful and at times very productive years with the Dodgers (Mannywood) during which any possibility of his future election to the Hall of Fame was probably buried by a 50 game suspension in 2009 for use of an illegal substance. His Dodger departure included a one finger salute to fans. David would hit 23 major league home runs, including another big one in Fenway. A year after Manny was Manny on his inside the park home run he snaked a grand slam off Bronson Arroyo around the Pesky Pole in right field with his parents in the stands. We like to think of it as David Being David. 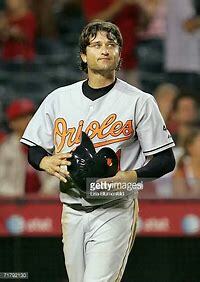 I always enjoyed watching your son play for the Orioles. He was a heads-up player on some lousy teams.